When Achim first sent me these in-game shots, I was under the impression that The Mollusk would be a tranquil, peaceful game. However, despite remaining tight-lipped about the project he soon set me correct, stating that The Mollusk will be a "fast scrolling game and it's about eating and getting eaten". He is currently working on AI routines and implementing controls. Achim's most recent C64 work was the excellent and highly nostalgic Space Trip, so I have high hopes for this one! Endurion is well known in the C64 scene for his AAA grade Psytronik/Cronosoft smash 'Joe Gunn', as well as being a relatively high profile name in the indie gaming scene. His latest Commodore venture, 'Soulless' (with graphics by Ovine's Smila) is looking very nice despite being in the early stages. However, it has been confirmed that this game isn't for the cartridge competition - Endurion is working on something else. When asked about progress, his reply was "Nothing ground breaking so far. Scrolling took me quite a bit longer than expected. I've got the basic engine going, but the game still misses some major bits. I'm still positive that I'll get finished in time though". A newcomer to the C64 scene, Jamie Howard's debut game Hyper Viper turned a few heads with it's unashamedly retro design and quality execution, so when I discovered that he actually lives within 10 minutes walk from my house I immediately signed him up for the competition! He soon came up with a neat little game design, and over a few drinks we discussed the concept in depth. Reactor Rescue will be an arcade style game in which you have to land on a number of planets and deactivate damaged reactors in sequential order, returning to your ship without crossing your path and simultaneously avoiding hostile native lifeforms and malfunctioning clean-up droids. Oh, and all of that before you die of radiation exposure! The game is already well under way, and as more observant readers may have noticed, I will not be judging this one because I'm actively involved in the project (helping with the design and pixelling). More news on this one to follow soon. 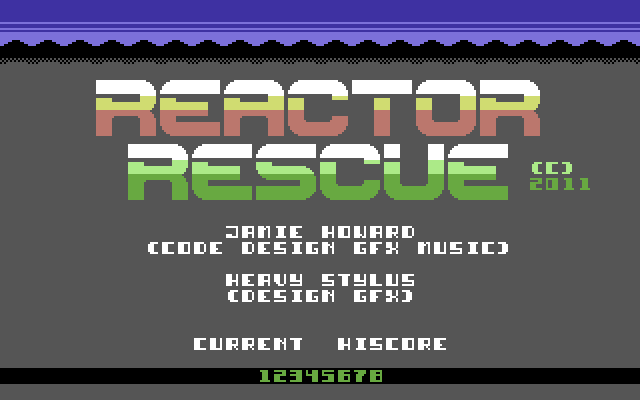 JCB of The Mean Team has been a C64 scener since the late 80's, so it's an honour to have him involved in this competition. His recent work includes a port of Knightlore (still in progress) and Taipan, so I'll be especially interested to see what he delivers. When recently questioned about his project, he replied that "it's in the planning/design stage atm. I've been looking at a couple of ideas and have settled on one but I need to make sure it's actually possible first. Once I've actually worked out the method to display what I want then the game itself should follow quickly from there. Don't really want to say what it is yet as I may switch to the other idea if I can't get my head around this one." Kerm1t of Mirage may only have one C64 game under his belt to date, but with his previous experience in coding within strict size limitations I have high expectations for his project. I'm still kind of hoping that Malcontent's entry is a cartridge port of his work-in-progress Dunjon Battler game, but in a recent email exchange he advised that he was planning something different for the competition. Other than that, I know nothing about his game. Other than these two cute sprites posted up on their blog, I know absolutely nothing about this entry. The filename 'aliens.gif' suggests that it will have a space setting or an alien theme. P1X3L.net's last game release was a 1KB Sokoban clone, so again it will be interesting to see what comes of this larger project. Another entry shrouded in mystery, this time from another C64 newcomer and coder of the highly acclaimed Commodore VVVVVV port. Unfortunately, after checking the filesize of VVVVVV (17KB) it seems we won't be getting a cartridge conversion of Terry Cavanagh's opus, but I'm hoping that Paulko64 will submit something equally impressive. A little information can be gathered on Richard's proposed game, Woolly Jumper, from his blog. It appears that Woolly Jumper will be a sequel of sorts to his recent Sheepoid game, which he describes as a 'psychedelic platform game with a slight twist'. He has since posted further details about how the game will be a shoot 'em up with platforms, sheep and aliens, as well as showcasing this little scrolling routine demo. I'm looking forward to seeing this one progress over the coming months. 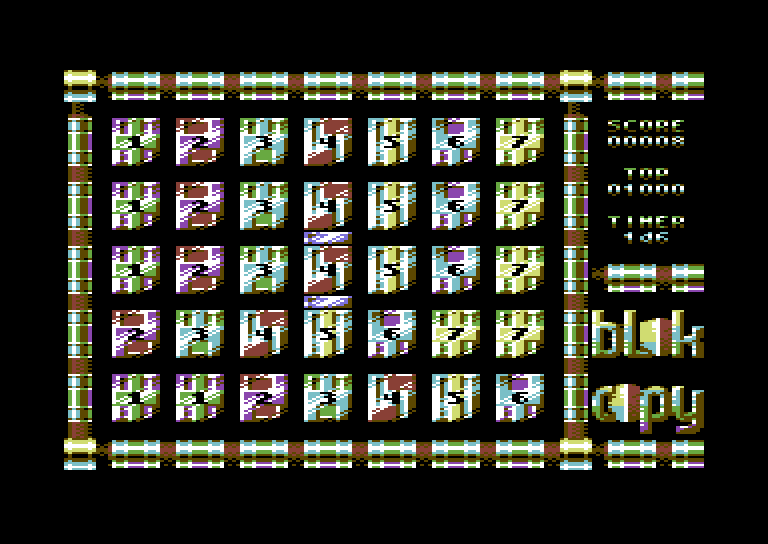 T.M.R's contribution to the competition is a C64 conversion of his PET and DTV game Blok Copy. Although not currently available to download (it will be as soon as the .PRG is released by Cosine), it's a great conversion of the challenging puzzle game and even contains a retro easter egg (in response to my request for a special feature)! Blok Copy will also be available to buy on cartridge from RGCD in the near future at the usual price. 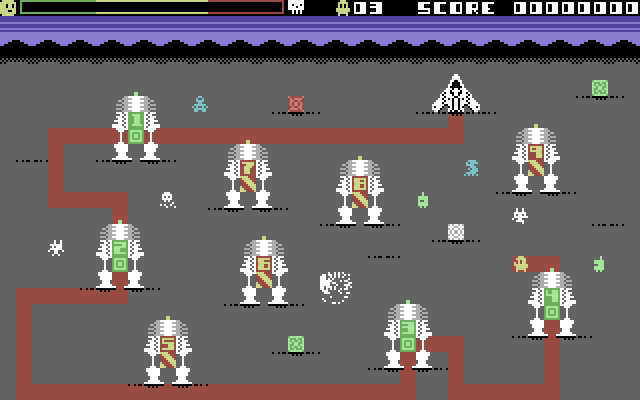 Another established C64 group, Vulture Design have released a lot of graphics and music (and even a few demos) to date, but this will be their first game. And apart from that, I have no other information to share. Famous in the C64 scene for coming out of nowhere and dropping the amazing Knight 'n' Grail on our laps a few years back, we've been waiting for a sequel or unrelated follow up game for what seems like ages. Mikael emailed me this evening to say that Wide Pixel Games have been experimenting with various ideas, and that he'll send me some mock-up graphics when he comes up with something he is happy with. And there you have it - hopefully 12 new games coming your way in the near future, and surprisingly there's a good deal of variation too despite the small file size (it would have been rather tedious to judge 12 pacman or breakout clones)! More news on these individual entries will be posted online as it comes in.